Do you want to take your event to the next level? Whether you are organising a Members' Race Meet, Family Fun Day or a Flagship Event, Your guests will be expecting a fun filled day with a relaxed atmosphere, plenty of varied entertainment and attractions in between watching the all important races. It’ll be important to hold young children’s attention, entertaining them whilst also amusing and engaging the parents and older siblings effectively. Aside from being able to keep the entire family interested, you’ll need a performer with a flexible act that can be enjoyed between races by those that fancy a flutter, and still able to perform for those watching the race. My flexible, family show is suitable for all ages and lasts between 10 and 30 minutes depending on the irinerary of the day. 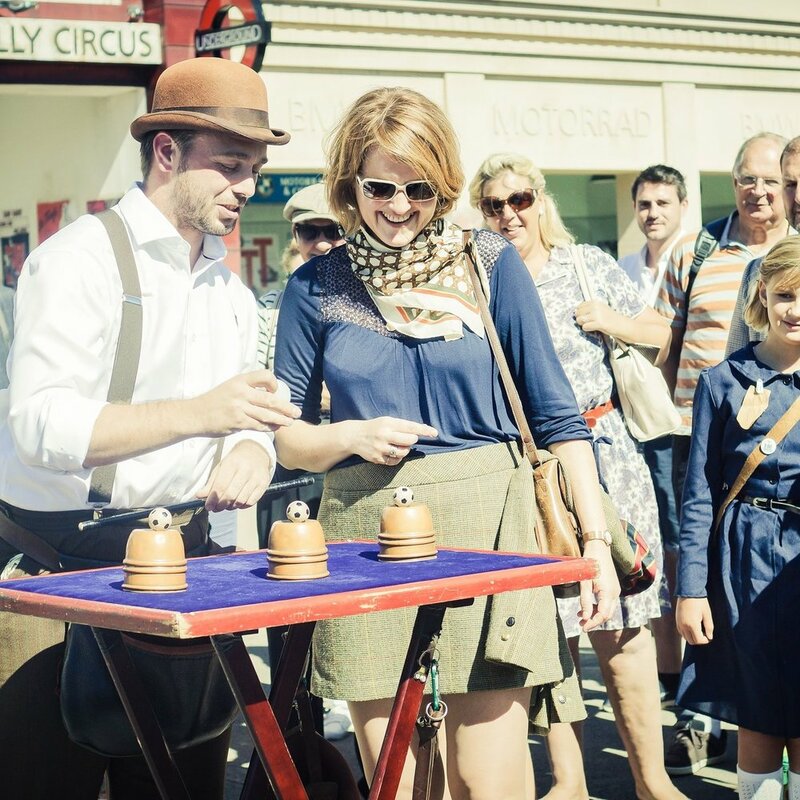 Whilst there is no betting in my show, the theme is a traditional cups and balls magic show which perfectly compliments the atmosphere of a day at the races. The show is easily portable, so I’m able to move around the grounds, making audiences laugh, clap and cheer with amazement. This allows me to seek out shady areas so that children aren’t exposed to the sun for long periods of time without realising it. Whilst races are taking place, I perform for individuals who are not able to watch the race while they queue for the fun fair attractions. I make sure everyone is having fun all of the time and no one feels left out. Those who take their racing seriously can do so, knowing the rest of the party is enjoying themselves too. Whenever you're hosting an event with a VIP guest list, it's essential that your clients' racing experience is even bigger, better and more enjoyable than last time. VIP clients and Sponsors have notauriously high expectations and standards, which means, at times, it can be hard to please them, especially when races dont end favourably. This is why it is important to get the proceedings off to a good start right away. You want them to relax, have fun and enjoy the excitement of the day, rather than sitting inside and talking about work or making awkward small talk with collegues before the racing begins. I'm able to break the ice quickly and effectively, generating a buzzing atmosphere by getting people chatting laughing and interacting with eachother. This is the ideal way to ensure everyone is feeling included and gets into the spirit of things leading up to the main events of the day. I have over 7 years experience in performing at racecourse events, especially at Family Fun Days. In fact, I’ve been booked every year to perform at the world class Goodwood Events since 2011, in particular to perform at their Family Race Days and in their corporate sponsorship and VIP hospitality suites.